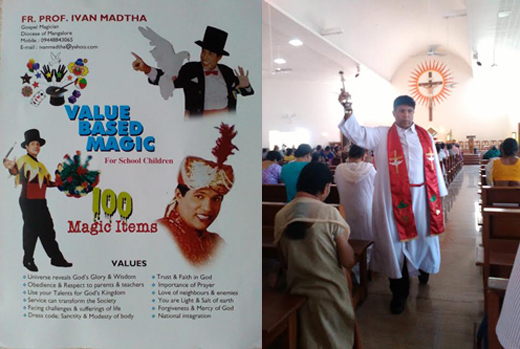 Mangaluru, Oct 30, 2016 : Rev.Ivan Madtha, a well known priest of Mangalur diocese, was invited by PMI, Prison Ministry India, National office in Carmelaram Bengaluru, recently and with the co-ordination of PMI held over 40 shows of ’value based magic’ in various schools in and around Beangaluru to raise funds for PMI in support of those in Prisons, their families and PMI. According to an official figure from PMI, 1, 68,000 school children attended the shows and were sincerely motivated by the magic items and talks which Fr. Ivan with the help of Sr. Doris, his assistant performed at different venues normally holding two to three shows a day on various stages. Early in November 2016, Rev Ivan is scheduled to undergo the 14th surgery on his knee, a major one at Fr.Muller’s in Mangaluru, for possible correction of his knee which was damaged severely in the train accident many years ago and which seriously impedes his movements. Hopefully it will help him beyond expectation with the help of God. Thousands of people in groups and individually are offering prayers and assistance for his speedy recouvery. 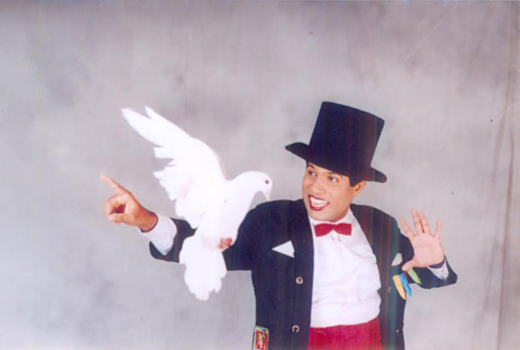 It may be noted that Rev Ivan Madtha met with a rail accident several years ago, lost his left hand, some fingers of the right hand and survived fatal injuries miraculously and after long rehabilitation helped by family and close friends has continued his spiritual and magic ministry more widely, actively and attracted people all over the country, specially South India, with the blessings of many faithful and staunch Catholics and organisations. He is certified as 80% disabled. He regularly also gives a very special ’retreat’ at Fatima Retreat Center and other places all over India. Magic is trick which attracts everyone . and some are just impossible to understand.